photos, books, etc. these display ledges are perfect for showcasing just about anything. Complete the look of your living room design. Create a Wall Collage: Bring together your favorite wall art without misaligned frames, leaning ledges, and damaged walls. These display ledges will perfectly bring together pictures of your favorite moments, or simplistic wall art to add a touch of contemporary design. and ready to hang with the mounting hardware included in the packaging. Just decide on which wall space you want to hang the ledges and install it. different wall materials require different screws and anchors. sitting on your coffee table and media stand, easily find your remote control when you need it. Each Shelf's Dimensions: 46" x 4" x 2"
Well-Constructed Design: The aluminium floating ledges are functional and light weighted to use for a very long time, it will not break, buckle or bend and cause any hazardous situations for your household. You can also easily uninstall and move it when relocating your home. Money Saving Solution: The wall ledges are perfect for people on a strict budget, you can get the set of 3 wall ledges for a reasonable cost. Use all three staggered on the same wall or separately in different rooms for more budget saving organization options. 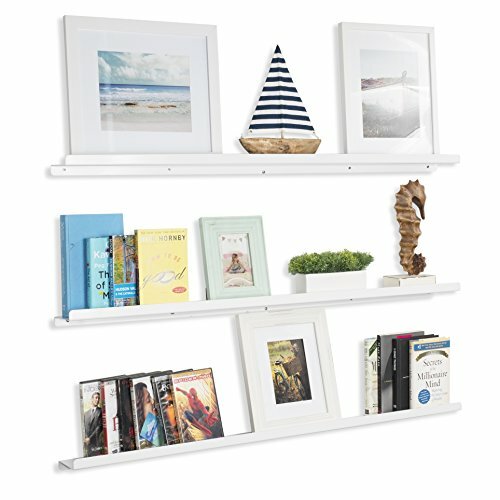 Space Saving Solution: The wall mount book display ledges will help you save on floor space, ditch the bulky bookcase solutions and move around independently in your living room. With simple organization, you can find everything easily at arm's length. Decorating Made Fun: Decorating your living room can be a daunting task but with the help of these ledges you can display books, photos, collectibles, flowers, and memorabilia. Don't miss out on an amazing opportunity to spruce up your small space. Use Walls More Efficiently: When there's no floor space, no room inside the closets or furniture cabinets the best option to organize, declutter and decorate a room is to use wall space. Empty walls make a room look incomplete, use your walls to complete your living room design.